You’re racing down the road in North Palm Beach. Music thumping. Sunroof open, wind in your hair. No traffic to slow you down. Suddenly, in your rear-view mirror you see the red lights of a Palm Beach County police car. The cop pulls you over and writes you a ticket for speeding. What should you do next? Pay the speeding ticket and hope you never get another? No way! Call The Ticket Clinic, North Palm Beach office, 1-800-CITATION. Florida / Palm Beach County’s point system for speed violations is tough. But simply because aNorth Palm Beach – Palm Beach County police officer says you’ve committed a violation doesn’t mean you’re automatically guilty. You have a right to plead your innocence and confront the evidence. The fact is, you should challenge any traffic ticket you get. Sure, you ought to learn from your mistake, but that doesn’t mean you shouldn’t explore every avenue to avoid the nasty consequences of the situation. Whether you have a spotless driving record or one that’s already questionable, you need to keep those points off your Florida license. The bad news is you got a ticket. The good news is there are numerous procedures available to avoid traffic-ticket conviction, even if you are truly guilty of the offense. The Ticket Clinic may be able to help. We believe that almost any case can be won. We’ll probe the technicalities. We’ll look for every possible way to get your fine reduced and minimize the effect on your driving record. In some cases, we may be able to have the ticket completely dismissed. We’ll do whatever it takes to ensure the best possible outcome for you. When you’re fighting something as critical as a traffic ticket, you want a lawyer who knows and understands all of the traffic laws. Law is unfamiliar territory to most people. Hire a knowledgeable traffic ticket attorney / lawyer who can guide you through the system with ease. Traffic court is similar to other types of legal proceedings. It takes a professional to succeed. When you fight your ticket, you’re likely to go up against a North Palm Beach – Palm Beach County police officer who has experience in the courtroom. He’s probably been there hundreds of times and knows how to best present his case. It’s part of his job to make sure that every ticket he writes in his North Palm Beach territory sticks. 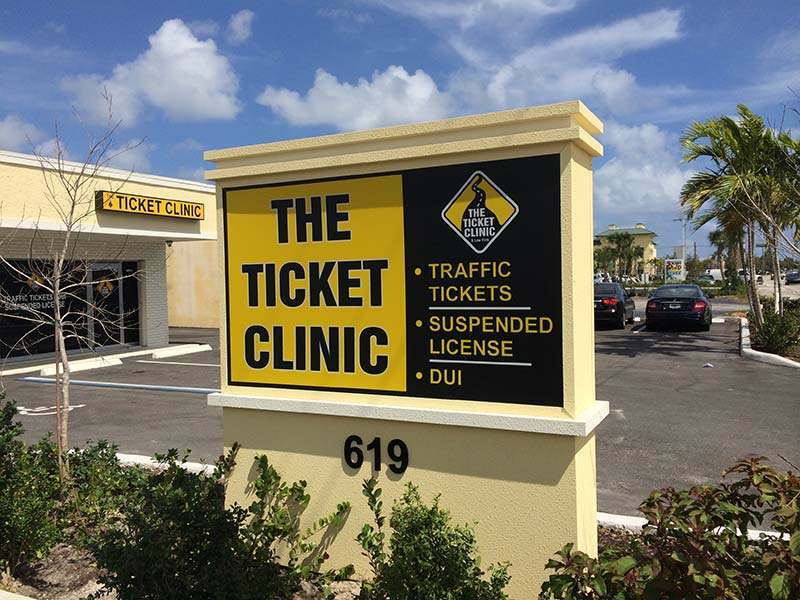 The Ticket Clinic may be your best shot at making sure it doesn’t. Whether your traffic ticket was an infraction, misdemeanor or felony and whether it’s your first ticket or your third, we can assist you in fighting the charge. Being represented by a skilled attorney is your best means to ensure a fair fight. We know the court rules and can present your case in a persuasive way, often without your presence in court so that you avoid missing a day of work. Other traffic ticket attorneys cover all aspects of the law. The Ticket Clinic concentrates on traffic offenses. Every day we go to bat for people like you who have received a traffic ticket in the North Palm Beach – Palm Beach County area. Choose to work with an experienced attorney, someone who knows how to handle situations like yours. Hiring a lawyer does not have to be expensive. At The Ticket Clinic, our fees are reasonable, especially when you compare them to the cost of the ticket and increased insurance rates. We accept Visa, MasterCard, American Express and Discover for your convenience. It costs you nothing to talk with us about your case. We offer FREE phone consultations toNorth Palm Beach – Palm Beach County drivers. We’ll give you an immediate assessment of your situation. Protect one of your most valuable possessions, your driver’s license. Contact The Ticket Clinic,North Palm Beach – Palm Beach office today!